The Wounde d Prophet by Michael Andrew Ford paints an honest and sympathetic picture, examining all areas of Nouwen’s life, including his family upbringing, his vocation as a priest, his outstanding gifts as a writer and speaker, his friendships, his sexuality and his deep restlessness. 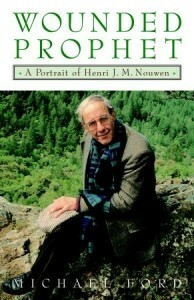 The Wounded Prophet was the first full portrait of Henri Nouwen to emerge after his untimely death in 1996 and paints an honest and sympathetic picture, examining all areas of Nouwen’s life, including his family upbringing, his vocation as a priest, his outstanding gifts as a writer and speaker, his friendships, his sexuality and his deep restlessness. In this new edition, 10 years later, Michael Andrew Ford reflects further on the process of writing the book and the reactions to its publication, on Nouwen’s enduring appeal and his legacy as a great spiritual writer. It presents an insightful profile of a man whose spiritually profound books emerged from his own wounded and searching soul. It remains essential reading for all those who have been touched by Nouwen’s writing. 242pp, Darton, Longman & Todd Ltd., 1995. To purchase this book online, go to www.darton-longman-todd.co.uk. Henri Nouwen was a priest whose identity was rooted in what he always referred to as ‘God’s first love’. Praying before the Blessed Sacrament every day, sometimes lying prostrate, he believed in theology’s original meaning – union with God in prayer – and nothing would keep him from this encounter. Even if he had been awake all night, as he often was, compulsively telephoning friends around the world, offering as well as receiving support, he would still get up at 6 a.m. to say the divine office when staying with his family in Holland, his brother would hear him pacing around the attic bedroom at dawn, following the Liturgy of the Hours before going off to Mass in a local church. But wherever his reveille with the Lord, it was rarely without its own chaotic chorus. His primary need for prayer meant he was completely oblivious to more mundane things. He would dash to the bathroom wherever he was staying and shower without closing the curtain, soaking the place in water. Then, without looking in the mirror, he would shave as quickly as possible, so he could get downstairs and be with God. As a result, he often ended up with a one inch patch of old whiskers on his neck and fresh soap in his ear. Nouwen was, in fact, a sensuous man whose massive hands, alive with nerve endings, were drawn to the smooth contours of aromatic soap as they were to the shiny grey rosary beads which he always carried round in his pocket. During prayer he could become transfixed by the size and weight by the size and weight of the stones as well as by the distinctive sounds they made. In his room, often aglow with candles and icons, he would rub the beads over the surface of his hands as if they were Braille and, with the same sensory touch when celebrating Mass, he would sometimes lift the glass chalice with one hand and caress its curvature with the other. Although rarely seen in his Roman collar, he loved to wear long, coarsely woven stoles, made of soft pastel fabrics. As he walked around the big weighty tassels hit his legs and back reminding him of his responsibility to the priesthood into which he had been ordained in Utrecht Cathedral in 1957 and to whose archdiocese he was ultimately answerable. Through acts of devotion and adoration Christian ministers had to learn to keep listening to the divine voice of love and find within it the wisdom and courage to address contemporary issues. Only then would it be possible for them to remain flexible without being relativistic, convinced without being rigid, willing to confront without being offensive, gentle and forgiving without being soft, true witnesses without being manipulators. Such thinking underpinned the whole of Nouwen’s theology and was never more evident than in his relationships with other people, especially in a sacramental context. Every Mass at the L’Arche Daybreak community in Toronto, where he spent the last ten years of his life, was an artistic event. He would involve children and adults, handicapped and able-bodied, asking them to act out what he was saying. No one was excluded and it had to be alive. ‘There was a kind of living artistic sensibility in Henri’s way of being, in his way of structuring worship and in his way of celebrating’, said his friend, Carolyn WhitneyBrown, herself an artist. ‘L’Arche celebrates diversity and eccentricity, and that was one of Henri’s fundamental beauties: his absolute delight in eccentricity, peculiarities and the uniqueness of people. He had very good eyes to see that, and for me that was a profoundly artistic sensibility’. But for Nouwen the practice of prayer was never easy. While many readers might imagine their favourite author to be a serene guru-figure, praying in a contemplative posture, they could not be more mistaken: he could rarely sit still for long. When he was in prayer, he fidgeted, coughed and moved but seemed to have no awareness he was doing it. His apparently restless and distracted prayer nurtured him. While his body was twitching, his spirit could be deeply present to God. I was conscous of being in the company of a world-class contemplative and I was expecting to have an extraordinary experience sitting next to him during worship. But as we sat in this plain, unadorned room and settled into the silence, I realised that the bench was jiggling. I opened my eyes, glanced to my left and saw Henri’s leg working furiously. He was anxiously trying to settle but without much success. As time went on, the fidgeting got worse. I opened my eyes again only to find him checking his watch to see what time it was. This incident introduced Parker Palmer to a person of paradox who indeed had a profoundly contemplative heart but who needed to be constantly on the move, a man filled with immense energies which were difficult to harness. But did such tensions collaborate to form a certain kind of genius? As a spiritual author himself, Palmer believes that Nouwen’s books were deeply engrossing and engaging precisely because they came out of this ongoing wrestling match between the paradoxes in his own life. He practised what he preached – and he preached the struggles, sometimes the anguish, sometimes the joy, which he himself was living. Wherever he was in the world, Nouwen celebrated Mass every day, in churches, chapels or hotel suites. If he was staying with friends, he would ask them to join him for a celebration around the dining-room table, usually at 5 p.m. He welcomed anyone, Catholic and non-Catholic alike, to receive the sacrament. He was sufficiently secure in his belief that the Eucharist was a gift to humanity to be able to sit loosely to the official Roman position that only Catholics in full communion with the Church should be allowed to receive. Nouwen was even prepared to give the sacrament to non-baptised members of his own family – although, if they received regularly from him, he would suggest that they might like to think about joining the Church officially; but he would never insist. In the setting of L’Arche, where community members came from many traditions, Henri Nouwen was sensitive to the difficulties surrounding intercommunion. But in the context of small community gatherings, he was pastorally concerned for non-Catholics, who always found him welcoming if they wished to receive Holy Communion: people and their relationship with God mattered much more than strict adherence to ecclesiastical law. What was harder for him was getting to Mass on time. The congregation at Daybreak grew accustomed to their pastor rushing in at the eleventh hour – the art of genuflecting on the run became a liturgical gesture in itself – yet the impact of his eucharistic services was always profound and was remembered long afterwards. Every day I would go to his Mass with the Catholics and the Protestants in that cave-of-the-heart room. On Monday nights I would join the group in his house where we talked and chanted psalms, and I took one of his courses on contemplative Spirituality every semester. When I graduated, Henri advised me to take a retreat in a Trappist monastery, so I went for 30 days as a monastic associate. I emerged from that month-long experience of spiritual direction with new and profound insights into my vocation. From that day, I have gone on a retreat once a year. Nouwen himself regularly made and heard confessions. Once, when staying at his father’s house in Holland. Henri decided to go to a neighbouring village to make his confession to a priest who had (Nouwen believed) a particular gift as a confessor. When he came out Nouwen expressed not only relief and joy, but also distress because he had apparently been the first priest in seven years to go to that man for confession. Here was somebody with a rare charism for helping people experience the mercy of God, and no one wanted it. I’ll never forget it. His voice was low and he embraced my feelings. I walked out of there as if it was really something. It lasted 45 minutes and it wasn’t easy, but it was one of the greatest times that I ever made use of the sacrament of penance. He didn’t do a lot of talking but it was a beautiful experience because he had the ability to put you at rest. But what was so special about Nouwen’s approach to spirituality, and how presumptuous is it to call him a mystic? Nouwen dearly had a great gift for articulating what was in his heart, and felt that it would profit his fellow Christians if he shared his insights, much in the way that Julian of Norwich felt compelled to share her mystical experiences so as to edify and give pleasure to her fellow Christians. Henri was perhaps a mystic in the making. But in his monastic experiences at the Abbey of the Genesee he embraced the mystical dimension, and spirituality became his theology and psychology. Nouwen saw the human heart as the centre of being, a sacred space within all people ‘where God dwells and where we are invited to dwell with God’. (4) As the mind descended into the heart, through contemplative meditation (for example, by using the Jesus Prayer), so a person’s core identity could progressively conform to the image of Christ. Through spiritual practice, that person could enter into the heart of God. For Nouwen, the heart was that place where humanity and divinity touched, the intersection of heaven and earth, where the finite heart of humanity was mystically unified with the infinite heart of God. Henri Nouwen tried to look at people and the world with the eyes of God, speaking and writing from the place of divine-human encounter. He called it speaking ‘from eternity into time’. (5) But to stay close to God meant being near to the person of Jesus, to whom he was utterly devoted and whose spirit he saw most strikingly at work in the poor, the disadvantaged and the marginalised. Real theological thinking was thinking with the mind of Christ, not engaging in what he termed pseudo-psychology, pseudo-sociology and pseudo-social work, psychology, sociology and much theology, he argued, asked questions ‘from below’, shedding light only in one realm of reality. Real theology was theo-logia, the personal and prayerful study of God, which could access answers ‘from above’, of the higher, deeper eternal realm. These positions were not literal, but were symbols of divine and human sources of wisdom and understanding. When Nouwen was in Rome, experiencing many complicated issues as a priest, he sought advice from Mother Teresa of Calcutta who was also visiting the city. After he had shared his anxieties with her for ten minutes, Mother Teresa said simply but profoundly, ‘Well, when you spend one hour a day adoring your Lord, and never do anything which you know is wrong … you will be fine! (6) Nouwen later explained that Mother Teresa had ‘punctured my big balloon of complex self-complaints and pointed me far beyond myself to the place of real healing’. (7) He had raised a question ‘from below’ and she had given him an answer ‘from above’. At first, the response had not seemed to fit his question, but then he had begun to see that her answer had come from ‘God’s place and not from the place of my complaints’, (8)This convinced Nouwen that most of the time people responded to questions from below with answers from below. The result was more questions and more answers, and often more confusion. Both of these things appealed to him greatly and he understood that they did not need to be contradictory. He found something of that in Orthodoxy which appealed to him, espectally when he looked at the clarity of the Desert Fathers or the Fathers of the Church. He saw that it understood the psychology of Spirituality at that incarnate level, without needing the jargon of contemporary psychology. At the same time, unlike any psychology, it was capable of looking at the cross and the hope of resurrection. Henri was a curious, questing soul. Once he began to be interested in Orthodoxy, he came to see how integral icons were to its worship. I think he saw in icons something profoundly helpful to prayer, especially in the way they could become the focus of an interior stillness. Nouwen did not draw extensively on non-Christian spirituality, although he valued the writings of Rabbi Abraham Joshua Heschel and liked to quote Jewish stories when illustrating points about the spiritual life. The same was true with tales of Zen Buddhist enlightenment. During the early 1970s he had marched alongside Buddhist monks in anti-Vietnam War protests but this never led him to take much of an interest in the East, as van Gogh had done, or to explore Oriental spirituality with anything like the vigour of Merton, although he did have a genuine respect for the Dalai Lama. In later years, though, he visited the Hindu meditation master. Eknath Easwaran, in California, taking some of his contemplative insights into his own prayer life, and quoted Ramakrishna as an important spiritual figure. While he drew on rich spiritual resources, his own contemplation was born of much inner conflict. Colleagues and friends did not regard him as a mystic in the modem sense of being gifted with extraordinary graces: he was not a man of easy prayer but he wasn’t a person of illusions either. He wasn’t mystical in the sense of ‘ecstasies’; he was, however, a mystic in the traditional sense of being deeply spiritual. Nouwen was a priest who tried to follow the mystical path through earnest prayer and a disciplined sacramental life focused on the Eucharist. He read Scripture carefully, studied many of the spiritual classics and was drawn to God through icons and other forms of art. His was fundamentally a theology from the knees but, in spite of his faithfulness, the practice of prayer did not come easily to a man of such distracted temperament. His deepest contemplative moments often came when he was writing: these were times of solitude and centring for him. 1. Henri J. M. Nouwen, In the Name of Jesus (London. Darton, Longman and Todd.1989). pp. 30-31. 2. Henri J. M. Nouwen, With Burning Hearts (London, Geoffrey Chapman. 1994).pp. 93-4. 3. In the Name of Jesus, p. 46. 4. Henri J. M. Nouwen, Here and Now (London. Darton. Longman and Todd. 1994).p.8. 5. Henri J. M. Nouwen, The Return of the Prodigal Son (London. Darton. Longman and Todd. 1994). p. 17. 6. Here and Now. p. 75. 9. Fred Bratman and Scott Lewis, The Reader’s Companion (New York. Hyperion, 1994). p. 74. 11. Henri J. M. Nouwen, Clowning in Rome (New York. Image, 1979), p. 88. 12. As described in Henri J. M. Nouwen, ‘Pilgrimage to the Christian East, Ukrainian Diary Part 1′, New Oxford Review (April 1994). p. 14.